Daniela Corda is a cell biologist, Head of the Laboratory of Cell Regulation, and Director for Research and Development of the Consorzio Mario Negri Sud (CMNS) in Santa Maria Imbaro, Italy. She obtained her degree in Biological Sciences at Perugia University, Italy and her Ph.D. in Life Sciences at the Weizmann Institute of Science, Rehovot, Israel. She has been working in the signal transduction and membrane lipid dynamics field for more than 20 years, first in Israel, and then at the National Institutes of Health, Bethesda, USA, for her post-doctoral studies. 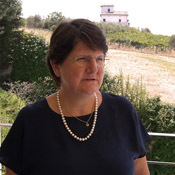 She moved to the Mario Negri Institute in Milan in 1986, and in 1987 she was one of the founders of the CMNS. She served as Head of the Department of Cell Biology and Oncology from 1996 to 2003. Daniela Corda's work has been published in leading journals of her field and she has been an invited speaker at numerous international scientific meetings. She has organized international courses and conferences, including a series of Advanced Courses of the Federation of the European Biochemical Societies (FEBS) on "Lipid Signalling". In 2000 she was elected member of the European Molecular Biology Organization (EMBO). She is also a Member of the Council of the European Life Scientist Organization (ELSO), where she started and chaired the ELSO Committee on Career Development. She was a Member of the Council of the Italian Society of Cell Biology and Differentiation (ABCD) from 1997 to 2000, and a corresponding member of the Women in Cell Biology Committee (WICB) of the American Society for Cell Biology (ASCB) from 2000 to 2004. She was member of the External Advisory Group for the Human Resources and Mobility (Marie Curie) Programme of FP6 of the European Union from 2003 to 2006, and since 2006 she is a Member of the External Advisory Group for the People (Marie Curie) Programme of FP7. Since 2004, she is a Member of the FEBS Advanced Courses Committee. She regularly serves as a referee for several international journals and granting agencies.